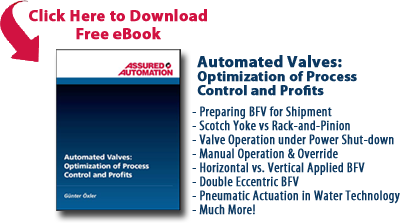 The V4 and NV Modulating Electric Actuators by Assured Automation offer a low cost, easy to use operator for your quarter turn control valve applications. Safety First: Make sure all power is off. A wiring diagram can be found on our website, or if needed, on the inside cover of the actuator. To access the terminal strip, remove the black indicator cap by pulling upward. Remove the exposed screw with a Phillips-head screw driver and pull the cover off of the base. It is very important to follow the wiring sequence in this order: wire your control signal before you wire your supply power. Wire your control signal as follows: put the positive on Number 6 and the negative on Number 8. Make sure the control signal is powered and sending signal to the unit. Now wire your supply power to the unit. For AC units, put the neutral on Number 1 and the hot on number 2. For DC units, put the positive DC on Number 1 and the negative DC on Number 2. The unit will do a self-test, which will take 3 seconds. The unit will then move to the corresponding control signal that is being sent to the unit. This entry was posted in Installation and Training, Latest News and tagged AC electric actuator wiring, control valve actuator, DC electric actuator wiring, Electric Actuator, electric valve actuator, modulating electric actuator, quarter turn electric actuator, wiring an electric actuator, wiring instructions. Bookmark the permalink.